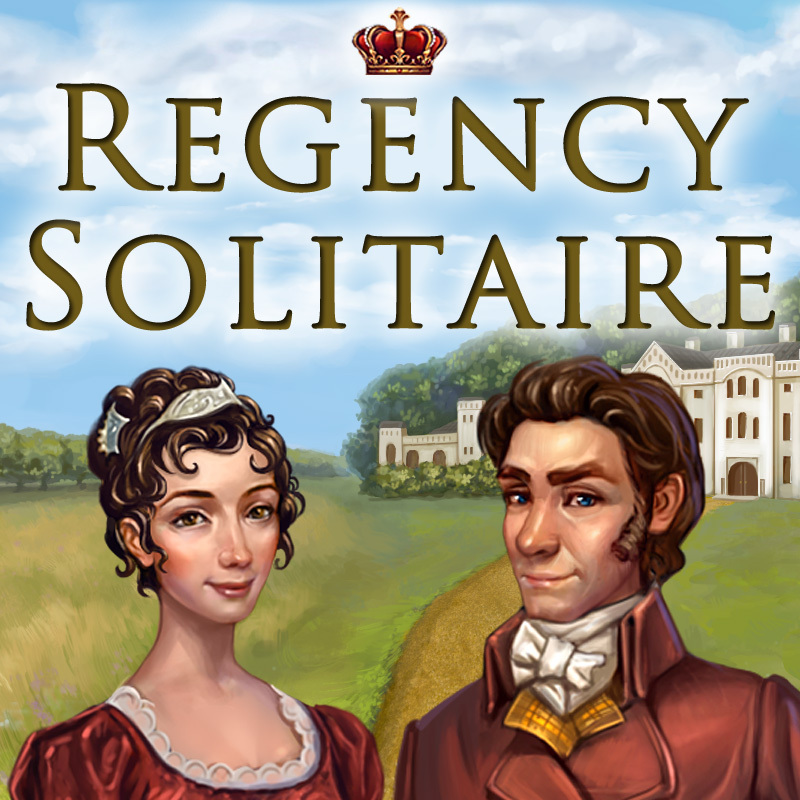 We just ran a 25% off weekly sale for Regency Solitaire on Steam and I collected the sales data so that I could compare it with the recent Steam Summer sale (June 11th-21st) which was also 25% off. [EDIT]I’ve removed sale numbers from this post so I don’t get into trouble with Valve, but I can still share my conclusions with you. – The sale was 25% off. – The sale started at 6pm UK time, which is 10am PST. Days on my chart are based on UK time, which is why there are 8 not 7. – Day 1 includes a few (not many) sales from the UK morning before the sale began. 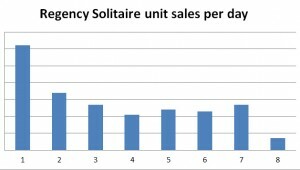 – On Day 8 I recorded the revenue/units sold as soon as the sale stopped. – I didn’t record wishlist adds at the same time each day but they aren’t updated in realtime anyway on Steam, so the daily change is only approximate. The totals are accurate though. – I didn’t have any big news/press/streamers during the sale, but I did constantly self-promote the sale via Twitter. – I launched the Steam Mac version on the same day as the sale started and used that as the update news for a Visibility Round. – A Visibility Round gives you 500,000 views on the Steam front page in the Recently Updated section. – I started the round at about 7pm UK-time and it ran out a few hours later. – It may have boosted sales on day 1 a bit, but not a lot. – However, there were 5x as many wishlist adds on day 1 as on day 2 so maybe it affected those more? – I didn’t get any special feature. – The summer sale ran from 11th-22nd June in UK days = 12 days total. – I didn’t have any big news/press/streamers during the sale but I did some self-promotion on Twitter. – I hadn’t yet released the Mac version on Steam. 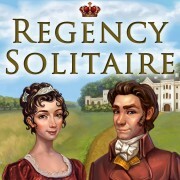 – Regency Solitaire was newer and “fresher” in people’s minds from press during the Summer sale but it had a lot more competition with other discounted games. – There’s an apparent lower level of sales after the Summer Sale compared to before the sale. I guess this is to be expected. – The dip lasted for about 2 weeks until Felicia Day tweeted about the game which resulted in a small spike followed by a higher base level. – Both sales were roughly equal in terms of revenue and units sold. 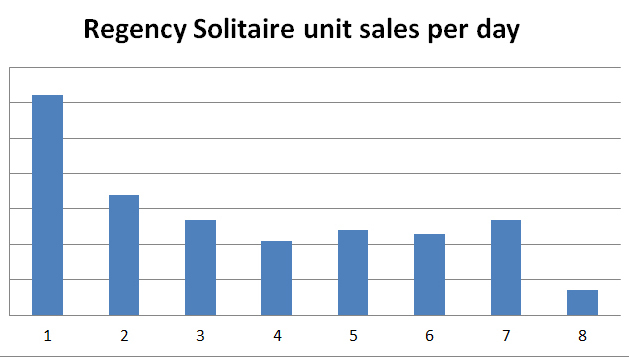 – The Weekly Sale performed slightly better in average revenue per day even if I take into account extra Mac sales, but not really enough to be significant. – The Weekly Sale definitely performed better in terms of wishlist adds, even if I assume the large amount of adds on day 1 were due to the Visibility Round I ran. – It hasn’t been long enough since the Weekly Sale ended for me to check for a subsequent dip in sales like after the Summer Sale. – Why wait for Steam sales? I should do more weekly sales! (Unless weekly sales hurt normal sales between discounted periods, but I haven’t analysed that yet). People who play the game love the game. It has had nothing but glowing reviews in the press and it has 94% positive reviews on Steam and Big Fish Games. So that’s pretty cool. However, it’s not selling that great on Steam as you can probably guess by these sale numbers. It’s just too niche for the Steam audience, although if it got promoted by Valve or a giant youtuber, I’m sure it would sell a whole bunch more. There are always more potential customers out there who haven’t seen the game yet, or who just need a reminder. Anything you, dear reader, can do to help get the word out is always appreciated. Thanks! This isn’t a disaster for us though because we aimed the game at the casual download portals such as Big Fish Games, iWin, GameHouse and more. In fact the game has grossed 10x more on those sites than on Steam! Overall the game is a success for us, and it’s bound to have a long tail as well, like our other games. Press/streamers, if you want a review key, please request it here. There’s also more info about the game here. Any thoughts? Let me know in the comments. Thanks! This entry was posted on Tuesday, August 4th, 2015 at 3:44 pm and is filed under Sales Statistics. You can follow any responses to this entry through the RSS 2.0 feed. Both comments and pings are currently closed.